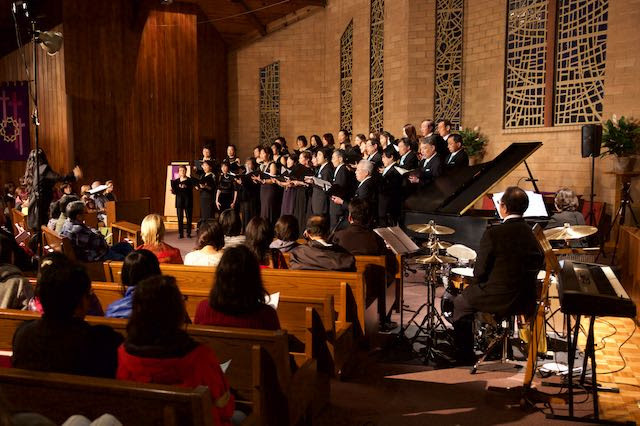 COSMO/Silicon Valley Community Chorus began in 1998 with 11 members, with a friendly, family-oriented atmosphere. Currently we have about 40 members. Activities include holding annual concerts, attending musical gatherings and appearing at various charitable functions. We enjoy singing many genres of music including sacred music, Songs in many languages, Broadway musicals, American standards, jazz, opera, etc. Our regular rehearsal is every Wednesday from 7:30 p.m. to 9:30 p.m. at Aldersgate United Methodist Church (*). For rehearsal/performance schedule, please click 'Calendar' on the left pane.